Modern sports history is filled with interesting examples of “the greatest teams to never win a championship.” The 1998 Vikings are on that list. The 2007 Patriots rolled through 18 wins — 16 in the regular season and two in the playoffs — without a loss, before falling in the Super Bowl to the Giants. The 2001 Mariners put up a regular-season record of 116-46 — tied for the most wins in any single MLB season — but bowed out of the playoffs in the American League Championship Series. The 1990-91 UNLV men’s hoops team cruised into the NCAA tournament with a 30-0 record and made it all the way to 34-0 before losing to Duke in the Final Four. And perhaps most famously (and painfully) locally: the 1998 Vikings, a seeming team of destiny after setting what was then a record for most points scored on the way to a 15-1 regular season, stumbled in the NFC title game. There are numerous counter-examples, of course — teams that dominated the regular season and won championships, like the 1998 Yankees (114-48), the 1996 Bulls (72-10), any number of UConn women’s basketball teams and even some recent Lynx examples. There are also plenty of reasons why teams who dominate a regular season fall short in the playoffs. You could make a strong argument that the primary reason is simply that they are consistently facing better competition in the postseason. But I’d also like to examine briefly the notion that when “teams of destiny” fall, the fact that they aren’t used to falling plays a critical role as well. The thought crept in more and more as I watched Golden State not only lose a game but lose its collective cool against Cleveland on Thursday night, forcing a winner-take-all Game 7 back in the Bay Area on Sunday. Granted: there was some bizarre officiating, but it cut both ways. 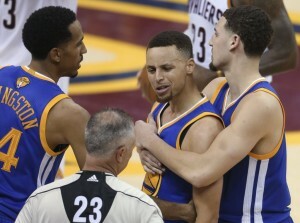 For the unanimous MVP, Steph Curry, to allow himself to become so flustered that he threw his mouth guard (hitting a fan, who happened to be the son of a Cavaliers minority owner) and got ejected — well, that speaks not just to the heat of battle but a player (and team) ill-equipped to save itself. Frankly, I’m surprised by it based on how the Warriors managed to pull themselves from the fire after trailing 3-1 in their last series to Oklahoma City. But being the best — and the 73-9 Warriors are the best regular-season team in NBA history — creates a burden while buffering you from adversity. And the postseason tends to be all about adversity. When the undefeated Patriots lost the Super Bowl, they gave up two fourth-quarter touchdowns in a dramatic 17-14 loss to the Giants. UNLV lost by two points to Duke. Those 1998 Vikings? They are the most personal example. Having watched every game, I can attest to the minimum level of adversity faced during the year. In their final eight games before facing the Falcons (including a playoff win over the Cardinals), the Vikings won by double-digits. Even some of the crustiest, least-trusting fans threw their hands up and said, “OK, this is the year. They are doing this.” Until the missed field goal … and the late TD drive … and the knee … and the overtime end. I’m not saying the Vikings would have won that game had they experienced more adversity throughout the year. The Falcons, after all, were 14-2 and awfully good themselves. I am saying that when your immediate experience is that everything is going to go your way and suddenly it doesn’t, you can have a hard time coping. That is what I see happening to Golden State — with its best player front and center — right now. It’s just one of 87 fascinating subplots and angles to watch Sunday in Game 7.